I designed a pledge drive T-shirt for Pseu Braun’s essential-listening Thing With a Hook radio show a while back and looks like they have the last few left for sale on the WFMU store. Now you can listener-support freeform radio and stealth brag for yours truly with one easy purchase! 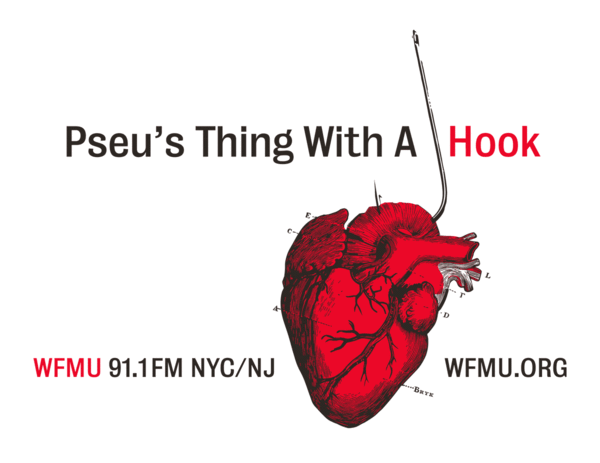 Pseu’s Thing with a Hook’s Hook and Heart t-shirt. Can’t wear your pop heart on your sleeve? Put it on your chest! Designed by pop genius Dan Bryk. First time offered since 2014. Only 2 XXL left! by bryk 1 Comment on Brike? Brick? Bryke? Bryck? LOL after nearly three decades of hearing my name mangled every which way (my favorite being that Chicago Tower Records header card that read “David Bryck”) the bit that starts at 37:00 means an awful lot to me.